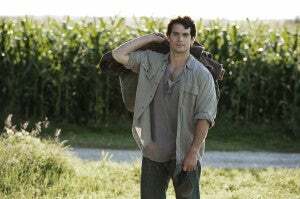 Man of Steel screenwriter David S. Goyer told Bleeding Cool that he and director Zack Snyder have already discussed sequel and spinoff ideas coming out of Man of Steel, but that the first tall building their film will have to leap in a single bound is Superman's day job. "We were able to sidestep the issue of the ludicrous glasses disguise in this film but going forwards, we’re going to find ourselves in a sticky wicket," Goyer said. "Zack and I have definitely talked about “Okay, hmm, this will be interesting.” Clearly Perry White and Steve Lombard see Lois kissing Superman at the end of the film. Perry’s not an idiot. Moving forward, he’s probably going to say to Lois 'What’s up with that?' We’re definitely going to have to go through some story gymnastics." Taking on a more realistic version of Superman's world also probably means that Lois Lane will be fairly restricted in what Superman-related stories she can cover unless she's the only one on the scene. Reporters who have a romantic relationship with the subject of a story are generally not allowed to cover that subject, and as a Pulitzer Prize winner with an editor who is "not an idiot," that issue will have to be addressed. Of course, in the John Byrne era of Superman comics (the "Man of Steel" era), a key component of Superman's disguise is that he simply wouldn't give anyone the impression that he HAD a life outside of being Superman. Since he doesn't wear a mask, and seems to be everywhere he's needed at all times, who would even think he has an identity to protect? The Byrne material is among the source comics that fed into this film, and so that could be a fairly reasonable starting point.